Chaos Created is pleased to announce that its commissioned games for TES have gone live as part of their 12 Games of Christmas Topic Pack. 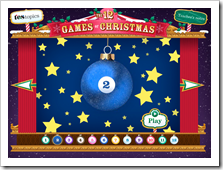 Following on from the success of our Fireworks Topic Pack back in October, TES has released its second Topics pack with 12 educational games based around the Christmas theme. Each game has an educational element to it, teaching number, subtraction, multiplication, division, addition and shape in interesting and exciting ways. Many of the games also contain the functionality to select a level based on the pupil’s ability, or to meet the lesson requirements of the teacher. 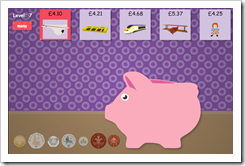 In Piggy Bank Saver, the pupil has to save the correct amount of money in order to buy each family member the present they desire. There’s a range of levels for dealing with amounts under 10p all the way up to £10 and including different coins depending on ability. Presents in the snow requires children to follow a number trail in order to uncover presents. Again these trails have different difficulty levels beginning with simple addition and finishing with subtraction delving into negative numbers. Snowflake Subtraction is a quick-fire game where pupils need to grab the correct snowflake to answer the sums. 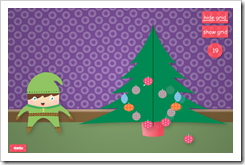 In Bauble Symmetry, pupils need to match where the elf is placing the baubles to create a symmetrical subtraction. The activity as a grid which can be toggled on and off accordingly. All four of our games are available, along with eight other activities, as part of TES’s 12 Days of Christmas.